The radiograph shows the tarsometatarsal bone (A) with the calcar (B) protruding from it. The calcar is surrounded by an extensive horny, keratinized layer (C). The calcar and the horny layer make up the spur. 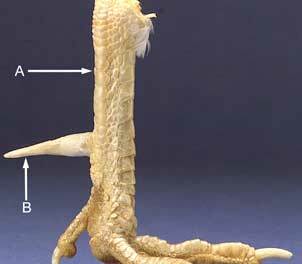 The photograph shows the leg (A) and the horny layer of the spur (B). Under this layer is the calcar, seen in Figure 1. The horny layer can be filed down, but like a toenail, it will continue to grow, and the procedure will have to be repeated as necessary. 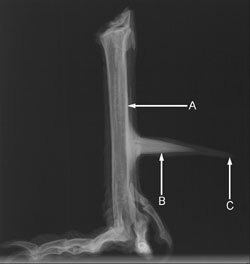 A spur is a bony, conical projection found on the inside aspect of the leg of sexually mature roosters, tom turkeys, and other male birds belonging to the Galliformes Order including guinea fowl, partridges, and pheasants. The spur, used as a weapon by the bird, is an outgrowth of the leg bone and is surrounded by a cone of horny (keratinized) material. On the male chick, the spur appears as a projection, called a papilla. As the bird matures, the papilla grows larger, hardens, and starts to curve. Can the spur be removed? The spur papilla can be removed when the rooster is still a chick. A veterinarian uses electrocautery to hinder the growing cells of the spur papilla. Since the bony core is not fully developed, the process is quick, non-invasive, and the bird recovers well. Removing the spur from an adult rooster is a more invasive procedure, because it involves the amputation of bone. The rooster is anesthetized, and a bone saw is used to cut the spur at its base from the tarsometatarsal bone. The skin has to be sutured over the wound and the area needs to be kept clean. Postoperative infection of the bone is a possible complication. Roosters that are part of backyard flocks can be dangerous if they still have spurs. Injuries to children, pets, and other chickens are likely if your rooster is aggressive. Increasing the size of your backyard flock to include more hens and roosters may subdue the aggressive rooster because chickens are social birds that need to form a structured social order. Adding more birds to the flock will allow the rooster to establish a pecking order among its own species, instead of among other animal species, including humans. Another recommendation is to file down the tip of the spur with a dremmel or other grinding instrument. Since the spur continuously grows, like the toe nails, this procedure will have to be repeated as the spur tip grows out. If these recommendations do not improve the flock situation, a veterinarian may perform surgical amputation of the spur. Since this is an invasive procedure, the humane use of anesthesia and postoperative pain relief should be included in the surgical protocol.